Any time when the temperature rises to unbearable levels and the humidity is very low for an extended period of time, it plays havoc on our beloved gardens. During these episodes, plants become stressed, agitated, and look poor or unhealthy. Plant responses to heat include but not limited to wilting, browning leaf edges; leaf, flower, and/or fruit may drop. These symptoms can occur during or after a heat wave. 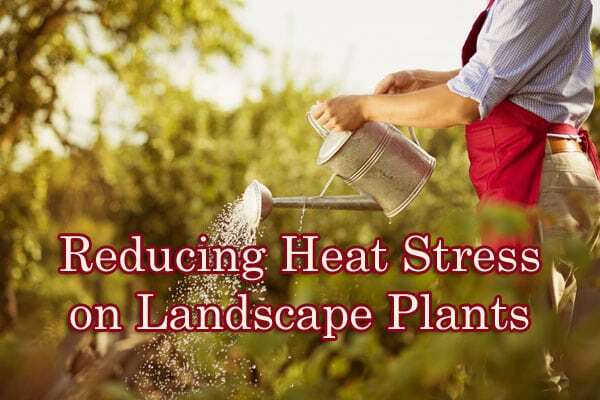 I want to make you aware of some strategies that when applied will aid in reducing heat stress on landscape plants. Be aware of extended weather forecasts. By knowing in advance that a heat wave is on the horizon you can prepare beforehand so your favorite plants will become less damaged. Some things to do before, during, and after this time period are detailed below. Whether your plants are in the ground or in pots it is important to water your plants deeply. By providing good thorough soakings (not a light spray) before a heat wave your plants are less likely to become stressed. During a heatwave go out to your garden and look around, if you see plants in trouble in the middle of the day, they must be watered well immediately. While on the subject of watering, If you rely on watering your landscape via automatic sprinklers, you may need to adjust the timer settings to water longer and deeper instead of shorter, shallow watering cycles. It is also advised to make sure your sprinklers are operating correctly and providing uniform distribution of water to plants in need. Watering your plants in the evening will help them recover quicker during the cooler times of the day. Water saving granules or crystals like Soil Moist can be added to existing garden beds and containers. They work by absorbing water and then slowly releasing it back into the soil, providing a steady water source when the soil around it has lost much of its moisture. Provide temporary shade for sun loving plants. Move sensitive plants that are in containers in the shade so they don’t get sunburn. For plants that are in the ground you can install a shade covering to reduce sunburn. By providing shade, less evaporation occurs though the stems and leaves therefore helping to mitigate and or prevent the stressful effects of heat. Another benefit of shady areas is that they have a higher relative humidity than exposed areas, which makes your plants happier. You may want to consider insulating your potted plants by wrapping shade cloth around the containers to keep them cooler. Provide a healthy layer of mulch both on the ground or in containers. Mulching requires laying a 2-3 inch minimum layer of organic matter such as bark or wood chips around your plants. This layer acts like blanket that cools the soil from the hot sun thus reducing water evaporation significantly by conserving soil moisture therefore decreasing the need to water. As the mulch breaks down, it promotes beneficial soil biological activity which in turn makes your plants grow stronger and vigorous thus being able to respond better to heat in a positive way. When applying mulch, spread it not just under the canopy, but as far beyond the canopy as you can. Keep in mind, roots extend two to three times the canopy spread. Please be advised when distributing mulch, it is not wise to put it right up against the main stem of the plant, instead keep this area clear. Applying the mulch too close can cause insects or diseases. Summer pruning may be necessary to reduce the leaves and demand on the roots. Also less leaf area means less water loss. If a tree or shrub wilts or begins to show leaf scorching or other stress symptoms, thin the canopy by one-third to one-half, depending on the severity of the stress. When pruning, it is suggested to selectively thin the plant instead of indiscriminately cutting, ruining the plants shape. Some plants with bulbous roots or other herbaceous perennials showing moisture stress can be cut back to within 6 inches of the ground. Most will return with vigor, assuming they get sufficient moisture to sustain what growth is left. If you have young or newly planted plants, it is important to realize that the root systems of these plants are shallow and therefore more susceptible to drying conditions in the top few inches of the soil. These plants need more attention to water on a more consistent basis. Ideally, you could wait until the weather becomes consistently cooler before planting. But if you must do the task during such an episode, it is wise to set the plant in a container in a partial shaded location until after the heat has surpassed. Another idea is to do so in the evening when the temperature is cooler. For your lawn area, to help conserve moisture and reduce shock, it is recommended to mow your lawn on a higher setting, between 3-6 inches tall. It stands to reason that taller grass casts longer shadows and the added shading from leaving your grass taller than usual will benefit the soil by helping to retain moisture. Also it is suggested to avoid applying fertilizers to your lawn during a heat wave, since the roots ability to absorb nutrients is diminished during that time. Wait until the weather cools down before resuming fertilization. After all the heat is gone, when regular rains return and cooler fall temperatures arrive, apply a phosphorus-based fertilizer, such as Superphosphate around stressed trees and shrubs. This will help them rebuild their roots during the fall and winter . By implementing these strategies you will be rewarded with healthier and more happy plants. If you have any questions don’t hesitate to stop by or call your favorite Green Thumb, we like you to have a successful garden.